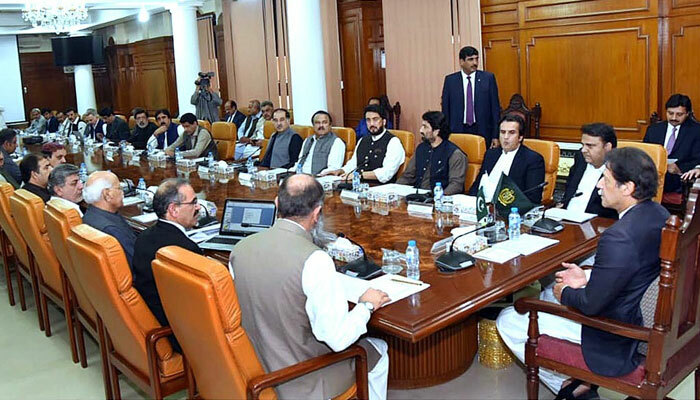 QUETTA: Prime Minister Imran Khan said on Saturday that his government was reviewing the China-Pakistan Economic Corridor (CPEC) agreement, promising to address Balochistan's reservations by giving the province its due share. The prime minister said this during his meeting with members of the Balochistan cabinet in Quetta. The meeting was briefed on the ongoing development projects in the province. "The Centre will work with Balochistan as a partner," Imran Khan said during the meeting. "We will not make any such promise for which we may have to make excuse later on," he said. Imran said that Pakistan’s progress was linked with the development of Balochistan. He further said the completion of Kachhi canal would bring an agricultural revolution in Balochistan. He said that of the 363 kilometre-long canal starting from Taunsa Barrage at Indus River, 281 kilometres lies in Punjab and 80 kilometres in Balochistan. Later, while speaking at an event, the premier requested Balochistan Chief Minister Jam Kamal Khan to adopt the new local bodies system, which is going to be introduced in Punjab and Khyber Pakhtunkhwa. He said the Pakistan Tehreek-e-Insaf (PTI) managed to bag two-thirds majority in the KP as resources were allocated to the lowest tier of the government. “There has been massive development in KP villages as the basic living standards of people have improved,” he said. Imran Khan said there is an urgent need for human development programmes in the province. Earlier, the prime minister visited the Southern Command Headquarters in Quetta. According to the Inter-Services Public Relations (ISPR), Chief of the Army Staff (COAS) General Qamar Javed Bajwa received the prime minister at the Quetta Air Base. Imran Khan was accompanied by Chief Minister Jam Kamal, and federal and state ministers. During the visit, a detailed briefing was given to the premier on security situation of the province, challenges and response to them. He was also briefed about the Khushal Balochistan programme, security of CPEC projects and progress of fencing along the Pak-Afghanistan border. The COAS said that having achieved stability in troubled areas of KP, lately our focus has been on Balochistan which was the economic future of Pakistan. The prime minister acknowledged and appreciated contributions of security forces towards improving peace, stability and socio-economic development of the province. He said that through a comprehensive national effort, cooperation between federal and provincial governments and assistance of army, we shall realise the true potential of Balochistan. He said that only a cohesive national effort shall take the provinces and the country to the rightful destination of peace, progress and prosperity. Meanwhile, a parliamentary delegation of Balochistan National Party (BNP-Mengal group) called on Imran Khan. The delegation included Senator Jehanzaib Jamaldini, Sana Baloch and members of the provincial assembly. During the meeting, six points of political parties included in the coalition government, economic and social progress and prosperity, welfare of the people of Balochistan, elimination of corruption and ensuring transparency were discussed and the resolve for continuation of efforts to achieve the set targets was expressed. Separately, the senior leadership of provincial chapter of PTI also met Imran Khan at the CM Secretariat. The delegation included lawmakers from Balochistan.